Barbara Casasola's collection showed some of my favourite pieces from the day. The designs were kept classic and uniformed in their silhouettes. The shapes created were a more basic design, but it really worked nicely to create a nice clean collection that worked well as a whole. I loved the high necklines and the long lengths of the pieces. Many of the pieces has different textures and layers to the designs adding an interesting lift to the collection. The color of the pieces were kept fairly mutual in the color palette. One of my favourites was a vibrant, purple jumpsuit (far right). I featured a high neckline and button details which created a uniformed look. Osman was another designer that I hadn't heard of before. I will definitely be checking back in with designer in future seasons to check out the latest collections from them. The shapes of the pieces were kept quite unstructured with there not being that much shape to the designs. The color palette consisted of both brighter colors contrasting alongside black. The black was used to add a base piece and color to some of the outfits. Bolder patterns and colors were the contrasted against this basic piece in order to provide a variation among the pieces. Simone Rocha created a bold collection with stand out designs. The shapes of the pieces varied throughout the collection, with some having a sleeker silhouette. Other pieces cinched in at the waist before flaring out to create a dramatic skirt. The color palette consisted of blacks, golds and red. The mixture of textures create a beautiful collection. I loved the checked design that was used among many of the pieces. It worked really nicely in both the solid design as well as in the design that featured sheerer cut outs (far right). Overall, I really liked Simone Rocha's collection, it offered a large amount of interesting designs and was a well rounded collection. Marques' Almeida's was a more relaxed affair to other pieces we have seen during the London Fashion Week. It featured a range of loose fitting pants and top pieces. Many of the outfits contained matching pieces in the same style and pattern. I loved the hair look for this collection. The colors were kept fairly basic, it was the patterns that really added a dimension and another layer of interesting to this collection. With textured, messy and a bed head style to the hair, it really added to the more casual look of this collection. This was definitely a collection that offered something different to the usual more put together style that is shown at London Fashion Week. It was nice to see something more casual and simple, shape and style wise, on offer. Another great day from London Fashion Week and a strong number of collections to finish this series of collections that have been showing at London this week. Thanks very much for reading this short series of posts. 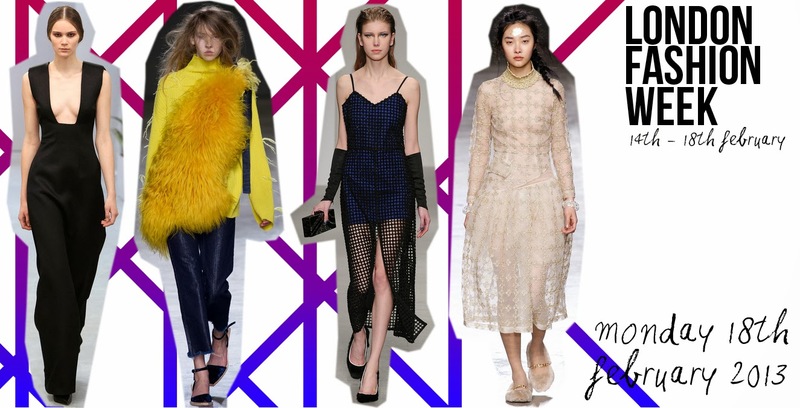 What were you favorite collections from London Fashion Week?